"FREAKING AWESOME" That is all Chicken Legs wanted me to say about this chicken. He took one bite and said this was the best thing I've ever made. I had to agree, this was absolutely delicious! This recipe is from Longhorn Steakhouse. My Mom found the recipe in the paper. I love this dish at Longhorn's and I was really excited to try it at home! I made this twice before I got it the way I wanted it. The original recipe called for the chicken to be cooked in a skillet on the stove. We tried it that way and it was good, but not as good as I remembered. I wanted to give it another try and decided to grill the chicken. That made all the difference. It was as as good, if not better as it was in the restaurant. Chicken Legs has already asked to have it again this weekend. He also asked if I would make some extra chicken for lunch the next day. This looks like a lot of ingredients, but it is really quick and easy. I marinated the chicken and prepared the ranch spread and parmesan crumb topping while Chicken Legs grilled the chicken. This is our new favorite dish! Combine ingredients for marinade and pour over chicken. Let marinate in refrigerator for 2-3 hours or overnight. Grill 12-15 minutes, until chicken is done. While the chicken is cooking, prepare the ranch spread and parmesan crumb topping. For the ranch spread, mix 1/4 cup of grated Parmesan and 1/4 cup ranch dressing. Set aside. 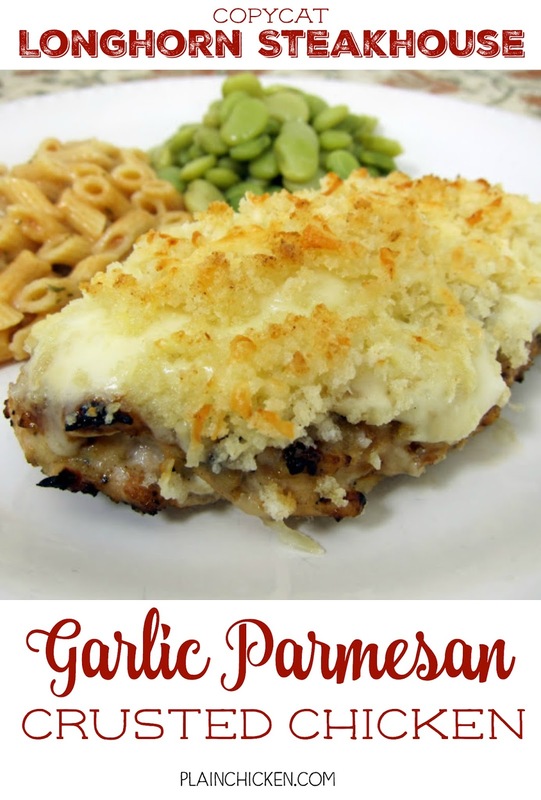 For Parmesan crumb topping, mix bread crumbs, garlic salt, shredded Parmesan and butter. The crumbs should be evenly moistened. Transfer cooked chicken to oven-safe casserole dish. Spread 2 tablespoons ranch spread on each breast, then top with provolone and Parmesan crumb topping. 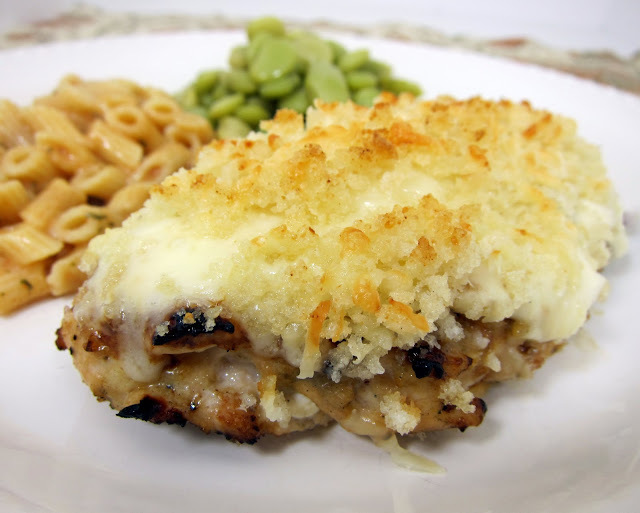 Place chicken under broiler and cook until cheese melts and crumb topping begins to turn light brown. Serve immediately. Oh my gosh this looks amazing! Not sure if I can buy ranch dressing in UK but I've found a recipe for homemade ranch that I think I'll try it with! The crust looks so crunchy and the flavors sounds delish! Pinned to share and remind me to make soon. I was wondering what type of ranch dressing you use. I have not been able to find a bottled one that I really enjoy. Market to or Ocharleys is awesome. It is at Walmart, publix, and Kroger, I hope u can find it. It makes all the difference!!! I know this is an older post but all I eat is ranch! I've tried a ton of different kinds and by far the best is Hidden Valley original ranch! Makes my mouth water thinking about it!! This looks amazing! You always have the best recipes. Yum! All the components separately sound good. So you know they are awesome together. I love your dinner recipes!! Pinning this to make for next week. Gosh, is there recipe you make that doesn't sound good? I've probably cooked up about 10 recipes from your site, all of which has been a hit with the hubby and kids. Thanks for sharing! Holy amazing looking. I wish I wasn't off dairy right now ;(. What did you put on your pasta? That looks good too. Thanks for the recipe! "FREAKING AWESOME" is a hard compliment to beat. This will have to be tried here. I rarely comment, but I just had to say that I have been looking for a good knock-off version of this forever! You're awesome! I'm your newest follower. Please feel free to visit, and follow me back. This looks so good! I can't wait to try it out. I love your blog site! YUM. When you make it again for your hubby, with the extra for his lunch, please also make some extra to send to me please. It looks SO good. You have no idea how excited I am to try this! That dish is all I ever get at Longhorn so I am super excited you posted this! Made this tonight for my the family. Everyone loved it, even my picky little sis. Thanks for the great recipe! Can anything be substituted for shredded parmesan? Lisa - you could use grated out of the trusty green can if you would like. Made this recipe tonight and it was delicious! This was amazing!! Thanks for the recipe! :) YUMMY!! I was just wondering, where does the provolone come in? I see it in the ingredients sections but I can't seem to find it in the recipe? I made this for dinner last night and my family loved it. Even my two girls who are very picky eaters gave this chicken two thumbs up. The chicken was so flavorful and delicious I will definitely be making this again. Thank you! Omg this was to die for! Thank you! Soooo good. Love everything I have tried from your blog! This is an awesome recipe! I made it today for my mother-in-law and aunt and they said it's some of the best food they have ever had. Thank you!! Cara - that is great news! I am so glad it was a hit. Thanks for letting me know. I have tried several of your recipes and loved them! I would love to try this one but I do not like ranch. Is there something I could use instead? This is the dish that I almost always get at Longhorn! I was so excited to find the recipe. I made this chicken tonight & my family of 7 said it's the best chicken I've ever made! We all loved it! 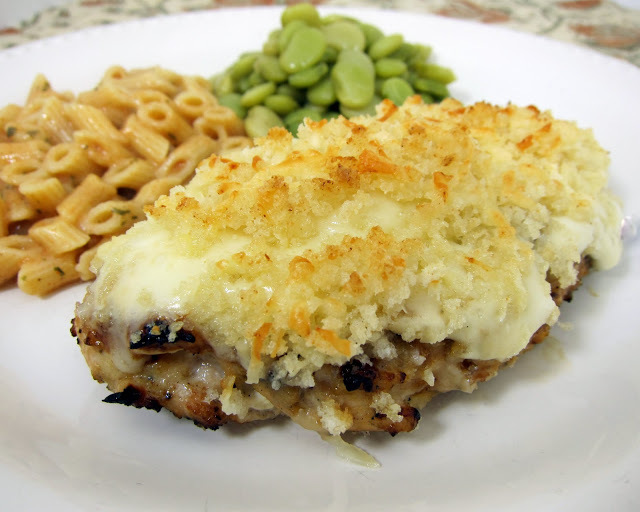 I used the canned parmesan in the ranch spread & a 'good' shredded parmesan in the crumb topping. I also used sliced provolone because that's what I had. Awesome recipe! thanks for sharing. I'm sure I'll be making it a few times a month! This was the greatest chicken I have ever made. If you are not sure after reading comments, go for it and make it. My whole family LOVED it, even young kids. This is our go to chicken recipe now. Oh, and I love your site. Bacon13 - so glad your family loved the chicken! It is one of our all-time favorites too. I made this last night for my husband and I's anniversary dinner. It was AH-MAZING! By far the most incredible chicken dish ever!! This will become a regular menu item in our house! Thanks so much for sharing this recipe!! I have seen lots of awesome reviews of this dish and lots of people saying they love the Longhorn version. I am curious of those who made it and have eaten it at Longhorn, how it compares :) Just curious, I can't wait to try it! I've eaten both and this is very similar to Longhorn's version. In fact, I think it is better. So does my friend that turned me on to the chicken at Longhorn. We both prefer the home version. ali - heat a couple of tablespoons of olive oil in an oven safe skillet. Pan sear the chicken for 2-3 minutes on each side. Put the skillet in the oven at 400 for 10 minutes. This is my second time reviewing this recipe. It's just SO good! I actually didn't realize that I didn't have provolone at the last minute, so I used mozzarella & we couldn't tell a difference. I also only use 1/4 c oil in the marinade & it's plenty. We love this chicken! OMG!!! I know no one knows how much I love LONGHORN'S chicken, but I ABSOLUTELY DO!!! My baby and I used to go there up to 3 times a week and that's ALL I would order. The servers knew what I wanted when they came to the table. I am not a cook at all, but did try another recipe I thought was close, but it was nowhere near!!! I AM SO, SO GRATEFUL YOU POSTED THIS RECIPE. I LOVE LONGHORN!!! I LOVE THIS CHICKEN!!! The recipe was so easy I was able to make it!!! That's saying a lot as far as cooking goes!!! I love it!!!! IT'S NEARLY the EXACT SAME TASTE!!! And I do love it much better!!! Thank you so much!!! You saved me a ton of money, and boosted my cooking confidence at the same time!!! lol! Can you put it in the over instead of the broiler? If so, how long should I leave it in the oven? at what temp? Lydia - the chicken needs to be broiled so the crumbs get toasted. The chicken is already cooked, so if you bake it, it will be dry. I can't even begin to describe how much I love this chicken! My boyfriend and I love to make this together because does the grilling and I can do the other steps. I think it's better then Longhorn! So so delicious!! Do you use white or apple cidar vinegar and also i kniw this is stupid but i dont think my oven has a broiler lol so what temp should i turn my oven on at? I cooked this tonight and it was delicious! Thanks do much for the recipe. The chicken was so juicy and I made a side of cheese tortellini with alfredo bail pesto.sauce and the whole meal was perfect. I pinned so hopefully more people can enjoy. Tried this the other night - it was just wonderful! The chicken was tender and juicy and very well seasoned! I love this dish at the restaurant, can't wait to make it myself! One question though, what kind of vinegar did you use? I used plain white vinegar.